If you're from Milwaukee -- or Wisconsin, for that matter -- you're probably aware that the sitcom "Happy Days" was set in Brew Town (although it wasn't actually filmed here). But what you may not be aware of is that viewers everywhere were actually getting a fairly accurate peek into 1950s Milwaukee. To make the show authentic, series creator Garry Marshall modeled Arnold's Drive-In -- the official hangout of the Fonz and crew -- after two Milwaukee restaurants, The Milky Way and the Pig 'n' Whistle. Both establishments have since closed, with the Pig 'n' Whistle (1111 E. Capitol Dr.) becoming the Riverbrook Family Restaurant, and The Milky Way (5373 N. Port Washington Rd.) being remodeled and opening as Kopp's Custard in 1978. The current manager of Kopp's in Glendale, Scott Borkin, tells the story: "The creator of 'Happy Days' used our original building as the idea behind the exterior of Arnold's because, at the time, it was a real drive-in with carhops. But the interior was inspired by the Pig 'n' Whistle because it looked more like a diner inside." Everything about Leon's is a throwback, including the portion sizes. If you order a single scoop in a cup, which costs $1.03 including tax, you can finish your custard in about the length of time the live studio audience would spend applauding Henry Winkler when he burst through the Cunninghams' front door. The servers wear white paper hats and the flavors are strictly traditional, vanilla, chocolate, and a special that changes daily. Today's was butter pecan. The nuts are roasted and mixed in at the last minute so that they're not ice cold, and the custard is a subtle butterscotch. Life is good when you have one of these in your hands. I don't really care which diner or custard stand was the model for Arnold's--although Milwaukee was supposed to be the setting for Happy Days, there wasn't much regional specificity in its representation of 1950s America. I don't even know if Leon's was typical of its time, assuming it has been preserved in its original state (minus the carhops, of course). What appeals to me and others now is that it fits our stereotype of a vintage custard stand, and this pleases us. I like to believe that Arnold's's inspiration exists just south of Oklahoma on S. 27th St. in the year 2006. Like the man in the John Ford movie said, "When the legend becomes fact, print the legend." More Milwaukee custard: Kopp's in Greenfield, Kopp's in Glendale, and a Kopp's photoset. I used to think Kopp's is better, but because it's closer to home I go there more often. After today, I'm on the fence. Hard to teel with is better. 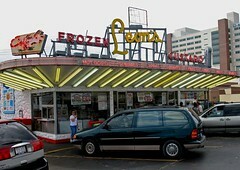 I forget the story, but one helped the other get started in the custard stand business. 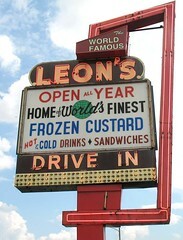 I think Leon's gave the first custard machines to the Kopp family and got them started. I say go to both! 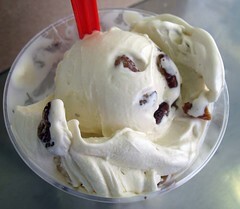 BTW: The "special" flavor at Leons is always butter pecan. While the article from OnMilwaukee.com contradicts the tale, another article from the same source (referenced in the Wikipedia entry) confirms the legend... personally, I'm more apt to believe the one coming from the Managing Editor. I recall reading somewhere (I wish I could source this) that the show's creator was put to task on the question. He answered something to the effect that he visited Milwaukee for ideas and that Leon's served as the primary inspiration, but he also looked at others in the area and elsewhere to get a general idea. Disclaimer: I wrote the initial Wikipedia article on Leon's. Y'know, there's a place in New York now called Shake Shack with frozen custard that has attracted ecstatic encomia from bloggers and other types, but they cannot touch Leon's. It's not even close. Visiting this place with you and the Little man was just the bee's knees.